Cemetery Junction - Graves of Noteworty Persons in the U.S. I found my 3rd Great Grandparents' graves at the Tombstone Project by the USGenWeb! Jonathan and Deborah Martin. This is Deborah's headstone. Buried at Bethel Church Cemetery, Saltcreek Twp., Hocking Co., Ohio. 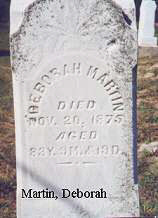 Thanks to Robert M. Sizelove who transcribed and contributed this cemetary to the OHGenweb Tombstone Project.